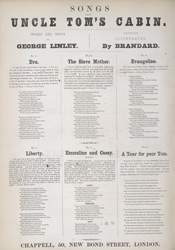 The most popular songs were those that relied on simple humour (jokes about the 'mother in law' were popular even then!) or those that used emotions to involve listeners; this is a very typical love song. The individual featured in the song is leaving his loved one behind in Scotland so that he can go, find work and make his fortune. He will return to claim 'Jean' for his wife when he feels he is successful enough and has enough money to start a family. Often these fortune hunters never returned.